BUKIT LANJAN: Cut down on your children's electronic devices play time! This blog post will not feature much commentary. The subject matter is of significant importance to the personal health of Malaysians and mankind. “Suffice to say, the smart phone is today a necessity not only for telecommunications, but also the many App applications to facilitate our daily life,” Gerakan Deputy Speaker Syed Abdul Razak Alsagoff said. He said Malaysians should, therefore, at least take some precautions to help reduce the risk of ruining one’s personal health. “What’s more worrying today is that even babies and toddlers are playing with all types of electronic devices that emit radiation,” he added. "Anyone who talks a lot on the phone, in particular, is exposed to a large amount of electromagnetic radiation," says Stefan Winopal, from German mobile phone website inside-handy.de. Mobile phones use high-frequency electromagnetic fields to transmit voice or data. When you talk on the phone, some of the energy from these fields penetrates your head, as Germany’s Federal Office for Radiation Protection (BfS) explains on its website. "The radiation is generated mainly by the transmission of signals between the mobile phone and the mobile base station," Winopal explains. The SAR (specific absorption rate) gives an indication of how much electromagnetic radiation emanates from a mobile phone. It's measured in watts per kilogram (W/kg). "SAR ultimately indicates the degree of warming that occurs when radiation is absorbed into the tissue," says Winopal. Microwave ovens work in a similar way to mobile phones. With microwaves, the difference is that "the food is being targeted with much more concentrated radiation, which results in a correspondingly higher heating effect," the expert says. It's still not clear whether radiation has a negative impact on health, says Winopal. "Studies are regularly taking place that either try to prove the risks of radiation or its harmlessness," he adds. Within current limits, the radiowaves are not considered harmful. The SAR value of a mobile phone must not be more than 2 W/kg. This maximum value has been recommended by the International Commission for Protection from Non-Ionizing Radiation since 1998. All mobile phones currently on the market are below this, the BfS says. "Values below 0.8 W/kg are generally considered to be good," says Winopal. "The Samsung Galaxy S8 has been tested with a SAR value of 0.38 W/kg, the Huawei P10 comes in at 0.96 W/kg and the iPhone 7 from Apple at 1.38 W/kg." For people who worry about radiation levels, there are steps that can be taken to reduce exposure. "If you talk a lot on the phone, you should have a hands-free system so that the phone does not have to be held next to the head," says Winopal. You can also use a Bluetooth connection, as it emits less radiation. 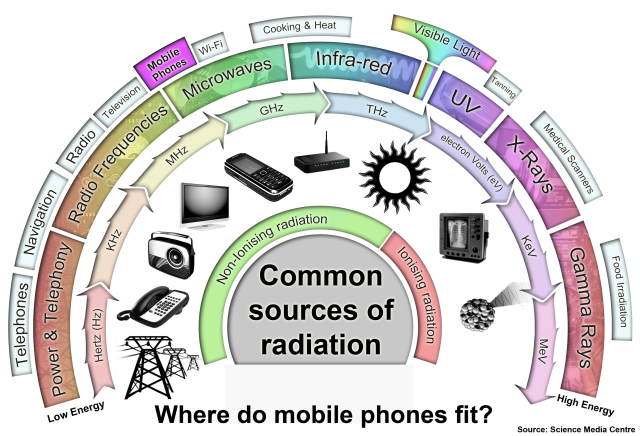 Even when not being used for phone calls, a smartphone emits radiation. For this reason, you should carry the phone in a bag or backpack rather than on the body. If you use the phone as an alarm clock, you shouldn't place it too close to your head at night. The BfS recommends using a fixed-line telephone when possible and keeping phone calls made with the mobile short. When the reception is bad, you should avoid calls altogether, as the phone uses more power. Because children are more sensitive to radiation than adults, the BfS recommends restricting their mobile phone use as much as possible. Deactivating mobile data connections can help in this regard. — dpa"